This is a wonderful signature piece to any costume or room. Its all-brass gaurd, grip and pommel give it a unique style that really draws the eye. 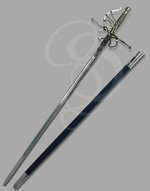 It also has a wonderful balance for a long-bladed rapier and is comfortable to hold no matter your size or gender. 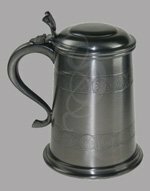 The Ambergale's compact grip is prefect for smaller hands, and it has a slightly better balance than most early-period thrusting rapiers. 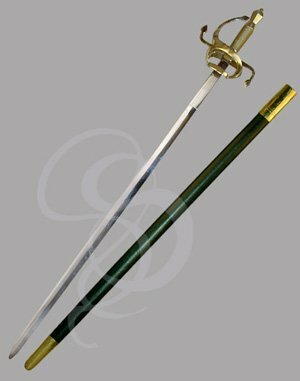 This rapier has a strong sense of nobility to it, with its golden hardware and elegant curves. 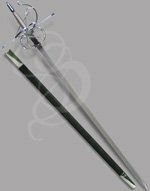 The lustrous braided coils on the grip are devastatingly graceful and seem to call out "hold me, hold me" (or am I confusing this rapier with that Tanya Roberts/Beastmaster dream I keep having lately)? 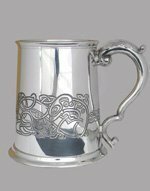 Anyway, the Ambergale is perfect for nobles, adventurous bards, swashbucklers and others of the upper-social-class ilk. The elegant blade is made from hand-forged high-carbon steel. The swirling guards are made from a highly polished brass, as is the unique, squared-off scent-stopper pommel. Braided golden wire wraps the hardwood grip, and a custom fit leather-wrapped wooden sheath completes the design. A stylish rapier designed for those with subtler tastes and an eye for sophisticated design.